To clarify, we’re thinking that as a standalone source micro wind probably wouldn’t cut it. The idea is to look at micro wind turbines in the context of a national distributed wind energy strategy. For those of you new to the topic, the Energy Department’s Wind Program definesdistributed wind in terms of application. If a turbine is located fairly close to the point of use, and is either off-grid or connected directly to a local distribution grid, then it fits the distributed wind energy mold. Although distributed wind energy strategies could include anything from 5 kilowatts on up to utility scale turbines, the Energy Department is focusing its grant dollars for distributed wind on the small/micro wind turbine sector. In contrast to utility scale wind farms, which take up a lot of space and typically require long transmission lines, distributed wind turbines can be scaled down to individual markets including agricultural operations, industry, commercial facilities, academic institutions, and a lot more. All else being equal in terms of site selection, the possibilities are practically limitless for micro wind application. In the “more” category, take a look at the way that professional sports franchises are using micro wind turbines, and you’ll see what direction we’re heading in. Aside from generating clean power, the eye-catching turbines ringing the top of a stadium add a shimmer of luster to the brand. The Philadelphia Eagles and Buffalo Bills provide a couple of examples. Last month, Ford took the brand luster approach to the next level by installing “Windy System” vertical-axis micro wind turbines at four selected dealerships. The sail-type turbines, from the company Wind Energy, sport the Ford logo so they double as kinetic signboards. In other words, in the micro wind market you don’t have to focus strictly on technology that gives you the biggest bang for your buck. You can also focus on aesthetics and brand identification. …you can see the attraction of micro wind turbines beyond their more practical uses. Although micro wind has taken its share of criticism on a cost-per-kilowatt basis, back in the early days of the Bush Administration the US wind industry worked with the Energy Department to lay out the “U.S. Small Wind Turbine Industry Roadmap.” At the time, the US micro wind industry was a global leader, and the aim was to keep it that way. Unfortunately, as global micro wind competition has heated up (here’s a recent example), support for the domestic wind industry has been facing some stiff political opposition. You can round up the usual (primarily Republican) suspects for that, with the notable exception of several state governors and longtime wind champion Iowa Senator Chuck Grassley. 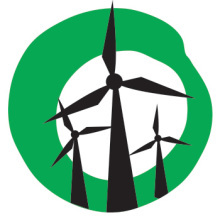 …The result would be thousands of new jobs and increased local economic development across the nation…Distributed wind systems have exceptionally high domestic content-exceeding 90 percent-and the broadly dispersed nature of this technology, in terms of applications, manufacturers, and installers, means that the expansion of distributed wind will create jobs and stimulate local economies in nearly every region of the country. So, what do you think? Is the time ripe for micro wind turbines? Even with oil prices crashing off the cliff, we’re seeing indications of stagnating demand for oil as more renewable energy and energy efficiency technology enters the US marketplace, and micro wind could play a part in that scenario. That doesn’t mean we’re off the hook in terms of the risks and impacts of oil extraction (and, for that matter, transportation) — it just means the US oil industry will have to seek new markets overseas when it emerges from the bust. ‘Distributed wind energy’, like a single turbine, is very much at the mercy of the local weather. The system is inadequate if the wind resource is not available. So such a system will need a backup and no such reference was made in the article. I suggest there is more to it than has been offered so far. In addition, the vertical axis model shown in the post is not a suitable example of an effective generator. VAWTs are generally inadequate as they are limited by the laws of physics in their capacity to generate electricity. That’s why one does not see such machines in general use.